A team of MIT researchers claim they can experimentally demonstrate the effects of a long-theoretical, third state of magnetism using materials known as quantum spin liquids. The magnetic field produced by QSL closely mimics that of a true liquid in its movements. Researchers believe further study of QSL and its magnetic properties could open doors in the realm of quantum storage, super conductors and quantum communication. Unsurprisingly, QSL is far different from traditional ferromagnetism -- a property of our Universe which points us North and gives Wooly Willy his trademark beard. QSL also differs from anti-ferromagnetism, a phenomenon where oppositely arranged ions in a metallic alloy can zero out ferromagnetic fields. Rather, magnetic fields produced by QSLs are in a constant state of movement. This is the result of particles within the material generating magnetic fields which constantly fluctuate due to quantum effects. Those fluctuations also have a strong interaction with each other, producing a kind of liquid-like magnetic flow. The exotic nature of QSL makes it quite unique and well-suited for potentially unexpected discoveries in technology and physics. Through its experiments, the team made a significant discovery, Lee says: They found a state with fractionalized excitations, which had been predicted by some theorists but was a highly controversial idea. While most matter has discrete quantum states whose changes are expressed as whole numbers, this QSL material exhibits fractional quantum states. In fact, the researchers found that these excited states, called spinons, form a continuum. This observation, they say in their Nature paper, is "a remarkable first." The QSL material being used to demonstrate this new magnetic state is called herbertsmithite (yes, really), a substance named after mineralogist Herbert Smith of paratacamite fame. Although scientists call it a quantum spin liquid, herbertsmithite is actually a solid crystal, making its demonstrably fluidic magnetic field all the more fascinating. 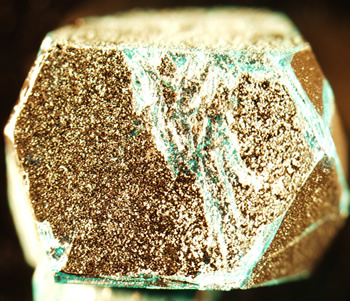 It took researchers 10 months to grow the pure herbertsmithite crystal being used in their experiments. Even so, the crystal only measures a quarter inch in length and weighs about two-tenths of a gram. Although not connected with the experiment, Harvard physics professor Subir Sachdev said the research team's findings "are very significant and open a new chapter in the study of quantum entanglement in many-body systems."